IRIX is a modular, function-rich, NDC-enabled travel reservation system that aggregates content from multiple travel services providers (selected at your desire) and resells the services towards different selling channels (B2B, B2C, corporate, white label) with fast integration time. The booking platform started as a comprehensive front office online booking system, and it was enriched with mid back office features in order to create a complete online travel booking solution. You will be able to scale your business and have a huge competitive advantage in the market through technology and the latest content from the agreed suppliers. IRIX provides you with access to a permanently expanding supplier network with just one integration. With just a simple log in, users see the best availability and price into a single screen. IRIX ensures seamless connectivity and integrations with flight, hotel, car rental, transfers, cruises along with activities, insurance, vacation packages and payment gateways. 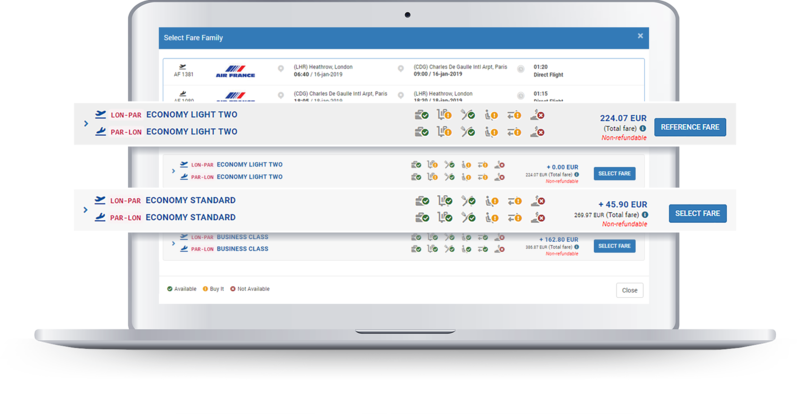 By using IRIX, your travel agents will have the possibility to personalize and customize each flight booking based on your customers specific needs with just one click. Apart from the extra revenues that you might gain, there is also the additional service, which leads in turn to improved customer loyalty. Being able to offer access to branded fares directly in IRIX will translate into an increased level of efficiency for your travel agents and cost savings for your travel agency. 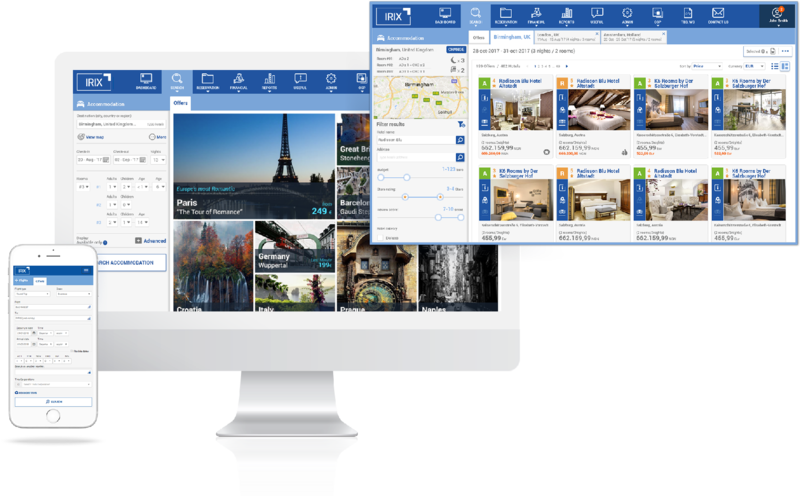 With IRIX you can easily manage all your Negotiated Fare content from the platform, so your travel agents can search and book directly from the booking engine accordingly. Searching for the perfect accommodation for your customers without losing too much time, is probably one of the biggest challenges faced by your travel agents. With features like “search by point of interest”, “meal-type”, “cancellation policy” available in IRIX, your travel agents can search smarter, faster and book the best accommodation option for your customers! The matching process can be stressful, complicated, costly and time consuming. You choose if you want to deal with it or to get rid of the hassle, by outsourcing it to us. Our team can do it for you: faster, better and cheaper. Needless to say that in travel, distribution is a key element to growth and sustainability; thus, a diverse and highly spread distribution network is very important to increase the sales volume. With IRIX, you can create unlimited number of resellers who will access your travel content for selling. The pricing structure of IRIX may be considered an essential competitive advantage for your agency, as no one time fees are requested when adding additional suppliers. You can add, remove or change them in a very flexible way and without having the risk of paying initially. This way, you won't be overwhelmed by the initial investment and you'll have the possibility to focus on other investments that will help you to grow. With TRIP – the B2C platform add-on, you can sell travel products directly to the end consumer, the traveler, and you can offer your travel content to your online users on an attractive website. With B2C online module, they will be able to easily search, book and pay with credit card for your travel services from your responsive website. Differentiate from your competition with the right technology and guidance! dcs plus is not just an IT company , it's a family for me. I work with dcs plus for over 9 years, it's not just the advanced technology, it is about the people behind. When looking for an IT company, you should count on dcs plus that you get the best product, the best service and real people to work with. We use the full platform: TBS hotel/flight/transfer/activities/ car rental engine, AIDA as our tour operator solution, TINA Mid Office, as well as TRIP B2C platform. Different businesses have different needs!